Welcome to the "Apparel for Fall" Giveaway Hop hosted by Heather from Mommy's Favorite Things and Michelle from Mama's Baby Cupcakes. This hop has a Clothing/Accessories Theme, and each blog has a minimum prize package of $25 per winner. After visiting my giveaway, make sure you use the linky below to take a look at the other blogs to see what they have to offer for you! Be sure to check out the Grand Prize on Mommy's Favorite Things blog for a chance to win from Umi Shoes and Zoey's Attic. Umi Shoes has stylish shoes for your children from infants size 1 to a boys youth size 9, and Zoey's Attic has wonderful custom shirts for almost any occasion! Umi Shoes and Zoey's Attic are 2 of my favorite children's brands. High quality items at an affordable price! You can view my most recent Umi Shoes review here. And my most recent Zoey's Attic review here. Both prizes sound awesome but the umi shoes especially I am excited about. Ohhhhh. Never heard of these!!! Looks awesome! I love Zoey's Attic, so I would be super excited to win that. I'm most excited about the Umi Shoes GC! I'm looking forward to the Umi shoes the most! I'm looking forward to the Umi shoes! I'm most looking forward to the Umi Shoes, although it may just be that I really like saying Umi Shoes. Custom Made Shoes are always better option then ready-made. I'm most excited for the opportunity to win a pair of Umi shoes! My daughter is 21 months old and her feet are growing so quickly! I am excited about the Umi shoes for my little great-niece. Oh can I say both! Love the Umi shoes! They have such a neat variety! And Zoeys Attic has the neatest personalized shirts! Umi shoes is what I am most looking forward to! I'm so excited about the Umi's Shoes!!! Both actually! I am looking at getting custom shirts for my oldest two to meet their new sister and what kid couldn't use new shoes?! I'd love to get the Umi shoes for my little niece! She is a crazy runner and they'd look great on her! I'm looking forward to the Umi shoes. Thank you!! I'm not sure which I would want more!! My kids love personalized clothes and accessories and they really need new shoes for winter! So excited about this giveaway! I'm excited about the Umi shoes GC!! I would love the Umi Shoes for my little grandson. I am looking forward to the umi shoes! 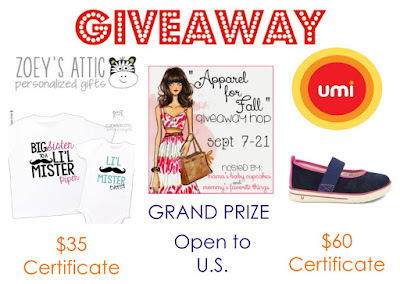 Both prizes sound wonderful but I think I'm most excited for the Umi shoes for my little guy! I like both Umi & Zoey's Shirts but I most look forward to the Zoey's shirts. I'm excited about both, but shoes are my favorite! I am interested in Umi Shoes for my granddaughter. Both are great, but I'm most interested in the Umi shoes! I would like the umi shoes. Thanks for the chance. I think I am looking forward to the Umi shoes the most. I would love to be able to get a pair for all of kids! They are adorable and very well made! With 4 grangsons I am most excited to win the Umi shoes. They go through them like water. I'm definitely looking forward to the Umi gift card! I want a pair for my daughter so badly! Looking forward to Umi shoes! They're both great but I'm most looking forward to the Zoey's Attic shirts. Thanks. I am most excited about the UMI Shoes. I love that brand. It really holds up. I'm really excited about the UMI shoes. These are great! I'm Looking for ward to the Umi Shoes. I am most excited about winning Zoey's shirts. I have seen them a lot around the internet and just think they are the cutest!! I am most excited abour umi shoes. Dont make me pick just one they are both amazing nothing better than cute clothes and great shoes love them both. To be honest, I really don't have a preference! I love the shirts and my grandsons would as well... but the shoes and styles are very cute too! My daughter could use some new shoes, so I'm excited about the Umi Shoes.